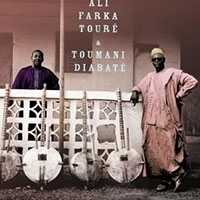 “Ali and Toumani” is the second and last album pairing the late guitar virtuoso Ali Farka Touré and kora master Toumani Diabaté. This beautiful album has easily been one of my favorites of the year so far. We are going for adds on the record today and tomorrow. Go here to read Pitchfork’s enthusiastic review of the album where they gave it an 8.3/10.